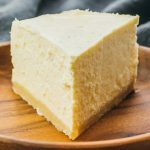 A quick and easy recipe for keto/low carb cheesecake made in the Instant Pot pressure cooker, with a gluten-free almond flour crust. Remove cold ingredients (cream cheese, eggs, heavy cream) from the refrigerator and allow them to warm to room temperature. Start this 30 minutes before proceeding with the rest of the recipe. Prepare an aluminum 6-inch round cheesecake pan with removable bottom or springform pan. Line the bottom and sides of the pan with separate pieces of parchment paper. Combine melted butter and erythritol in a mixing bowl, and stir together. Add almond flour, stirring until the butter is absorbed and forms a dough. Transfer the dough to the cheesecake pan. Use a spoon or measuring cup to firmly press down to form a flat and smooth crust covering the entire bottom of the pan. Add cream cheese and erythritol to a large bowl. Use a hand mixer to beat on low speed until well-mixed, about 1 minute. Remove the pan with chilled crust from the freezer. Pour the batter over the crust, careful not to leave trapped air gaps. Flatten the surface using a spatula. Add 1 cup of water to the bottom of the pressure cooker. Place the trivet over the water, with its handles resting on the sides of the pot. Place the cheesecake pan on top of the trivet. Secure and seal the lid. Cook for 30 minutes at high pressure, followed by a 15 minute natural release. Manually release any remaining pressure by gradually turning the release knob to its venting position. Carefully lift the lid to avoid dripping condensation on the cheesecake. The top of the cheesecake should be jiggly but not liquid. If needed, use a paper towel to carefully dab at the cheesecake to absorb any condensation on its surface. Turn off the pressure cooker. Let the cheesecake cool uncovered in the pressure cooker. After about an hour, lift it from the pot using the trivet’s handles to continue to cool on the countertop. After it has cooled, loosely drape a paper towel over the cheesecake pan and refrigerate for at least 24 hours. Do not seal tightly because the cheesecake needs to dehydrate. This recipe yields 4.5 g net carbs per serving. Nutrition information does not include erythritol because it cannot be digested by the body.